Spider Bites: How Dangerous Are They? Are All Spiders Harmful to Humans? When you think of spiders, what words come to mind? Creepy? Venomous? Deadly? Spiders are hunters, and they often use their fangs to take down their prey. But no spider in the world is large enough to hunt humans for food. In practically every case, a spider would prefer avoiding you over biting you. They may look scary, but spiders actually help people. They kill a lot of tiny pests that infest homes. Fleas and mosquitos are more harmful to humans, and they're some spiders' favorite foods. So when you think of spiders, perhaps the words that should come to mind are "mostly harmless," and "surprisingly helpful." There are roughly 40,000 different spider species around the world. Only about a dozen can harm humans, though. Even the spiders that are potentially harmful are unlikely to bite unless they think their lives are in danger. But if you do get bitten by a venomous spider, you will want to prepare yourself. How can you identify spider bites? For the most part, you can't. Common spider bites look like any other insect bite. You may notice a small, itchy spot on your skin. It could be red. It might irritate your skin, but it will clear up in a matter of days. Sometimes these bites hurt, but no more than bee stings. If they do hurt, the pain usually clears up in an hour or so. In North America, though, there are two other spiders whose venomous bites can be much more serious--even deadly in some rare cases. These are the black widow spider and the brown recluse spider. You'll learn more about these two spiders later, and what to do if one bites you. 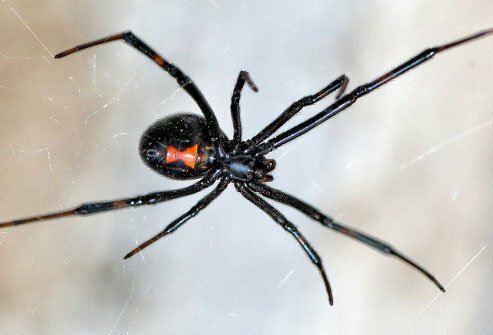 How Deadly Are Black Widow Spiders? If you have many of these symptoms, you are suffering from what scientists call latrodectism, the illness caused by black widows and related spiders. Mature black widow females have shiny, black bodies. Their telltale features are bright red hourglass marks on their abdomens (not on their backs as some believe). You can often spot this mark at night, as the female typically hangs upside down from her web after dark. Black widows look very different if they are male or immature, with white and brown bodies. But these varieties pose no threat to humans. 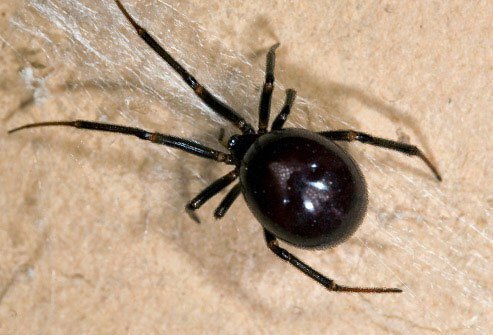 How Aggressive Are Black Widows? Black widows prefer not to bite if they don't have to. Scientists poked and prodded these spiders to see what their defensive reactions would be. They found that black widows try to avoid confrontation when they are merely poked once. If they are poked several times these creepy crawlies may bite, but they can choose how much venom they use and prefer to spare it when they can. More than half the time a black widow bite is "dry," meaning no venom is used. The most likely way to experience a serious dose of venom is by squeezing the spider. This provoked the most violent reactions in the study. So how deadly are black widows? Not as deadly as we tend to believe. According to the National Poison Data Center, about 1,800 Americans were bitten by them in 2013. More than 1,000 of these never sought medical treatment. Of the 800 who did, only 14 cases were considered major, and nobody died from their bite. Do You Have a Black Widow Bite? When you're first bitten by a black widow, it may or may not be painful. But if venom was injected into your skin you will know within an hour. By then the pain will increase and often spreads to your chest or abdomen. Some people experience stiffness in the belly along with stomach cramps. Profuse sweating, drooling, and dizziness can occur as well. The first thing to do if you suspect a bite is to wash the bite area with warm, soapy water. This helps prevent infection. Remember that quick medical attention can prevent many of the symptoms these bites can bring on, and quick care is especially important for the most vulnerable people such as young children and the elderly. 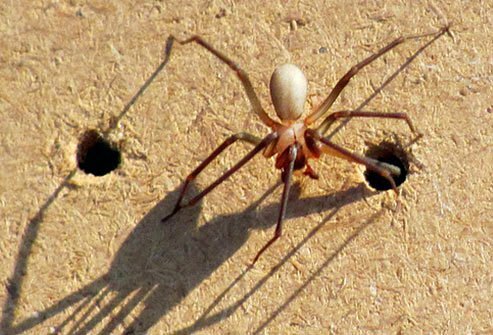 How Dangerous Is the Brown Recluse? The only other spider in North America that poses a medical danger to humans is the brown recluse. If you live in the American Midwest, chances are you live side-by-side with many of these tiny spiders. Even so, your chances of being bitten are slim. That's because they rarely bite humans. 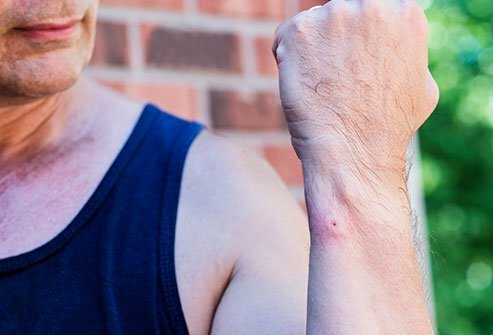 "I've had 100 recluse spiders running up my arm, and I've never been bitten by one," recluse expert Rick Vetter said in one interview. He spent 20 years studying this spider, and says fears of brown recluse spiders are overblown. Although the risk of being bitten is low, these are potentially dangerous spiders. However, no deaths have been reported in the United States. Even if you aren't killed by the spider, their bites can be extremely painful and scarring. Identifying brown recluse spiders is difficult for the average person. They are sometimes called "violin spiders" due to a brown violin-shaped marking on their cephalothorax (the body segment where their legs attach). But other spiders have unusual markings too, and this can be hard to distinguish. A better bet may be to look at the eyes of the spider. The brown recluse only has six eyes, whereas other spiders have eight. Recluses also have abdomens that are all one color (though their hearts can be seen through the skin). The length of the body is a little under half an inch. Far more brown recluse bites are reported than proven, and plenty of confusion remains about what these spider bites actually look and feel like. Genuine brown recluse bites leave the area around the bite deep blue or purple. Sometimes a bull's eye pattern develops around the bite with both a white inner ring and a large, red outer ring. A blister or ulcer may develop, which can turn black. Besides the unusual bite mark, you may develop body aches or headaches. Some people notice a rash, fever, nausea or vomiting. When the bite heals, it often leaves a small scar. While many believe a brown recluse bite is likely to eat their flesh away, that's probably not going to be the case. Although the venom these spiders produce can be necrotic for the skin at the bite site (flesh-eating), that only seems to occur about 10% of the time. In 90% of cases, skin reactions are more mild. Also, there can be many other causes of necrotic wounds. 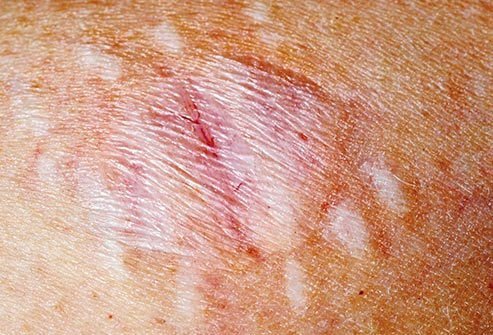 Unless you live in a region where brown recluse spiders are known to exist, the cause of your necrotic wound is almost certainly something else. 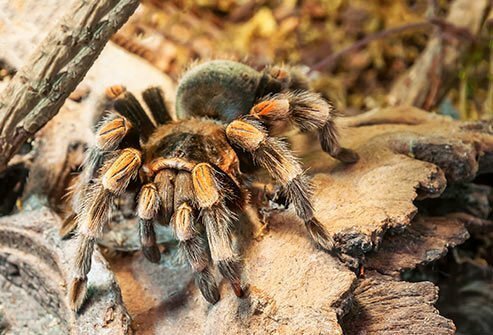 Tarantulas are big, hairy spiders that cause more frights than problems for people. Their bites can be painful, but they won't pose any medical emergencies. In the United States, you're most likely to find tarantulas in the desert Southwest. These spiders live a surprisingly long time. Some females live as long as 30 years in the wild (females live significantly longer lives than males). When they aren't biting their opponents, some tarantulas have another trick up their hairy sleeves. They can fling tiny barbed hairs at their target that are harmful enough to irritate humans and kill some small mammals. But with venom milder than the average bee, these formidable hunters are unlikely to send you to the hospital. If you live along the coast, you may spot a spider that looks strikingly similar to a black widow. The false black widow is about the same size as a true black widow, but it doesn’t have the red hourglass pattern on its belly. It’s also more oval-shaped than the real deal, and many have faint, light colorings on their black bodies that can be difficult to see. Their bites can be painful and produce symptoms similar to black widows, though much milder in nature. A bitten victim may see the bite begin to blister. It may be moderately or even severely painful for the first hour, and some people experience a sickness-like malaise, nausea, exhaustion, or headache for a few days. Although unpleasant, these spiders are not aggressive and bites are rare. Hobo spiders were once considered highly dangerous—even as dangerous as a brown recluse. But recent research has begun to cast doubt on this. People used to think bites from hobo spiders could decay the surrounding tissue, but this seems to be highly unlikely. 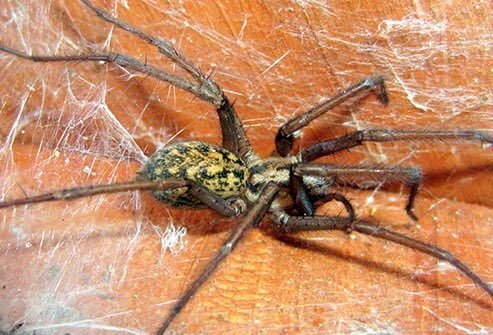 The hobo spider is a transplant from Europe that probably migrated to the Seattle area in the 1920s. In Europe, the spider’s bite has long been considered harmless to humans. The venom from European and North American hobo spiders has been compared, and no significant differences between the two creatures could be found. If you do encounter a hobo spider in the U.S., most likely you’re in the Pacific Northwest. These spiders are very fast; they can travel up to three feet per second. They weave funnel-shaped webs, and this along with their appearance mean that hobo spiders are commonly confused with the harmless North American funnel web spider. While black widows and brown recluses seem to get all the bad press, you’re far more likely to be bitten by a much tinier but more aggressive spider in your home. The yellow sac spider is the most likely offender when no culprit can be found. In fact, this spider is thought to be responsible for the majority of North American spider bites. These spiders are quite small—typically ¼- to 3/8-inch long—and they lack any conspicuous markings. They also like to take up residence in our homes. Yellow sac spiders move fast. They can scurry as fast as three feet per second. They have to be fast because these arachnids hunt down their prey for food. The most unpleasant characteristic of yellow sac spiders, from our perspective, is that they have no problem whatsoever with biting humans. They’ve been observed biting humans without any provocation. Their bites start out painful, prompting a burning feeling that can last up to an hour. For the next hour up to another 10 hours, they leave a blister and rash. Fortunately, the jaws are too small to bite through the skin in some cases, and when they do bite, the yellow sac spider may not leave much venom. Regardless, the bite is rarely considered serious enough to require medical attention. The first thing you should do if bitten is to try to identify the spider. Capture the spider if possible. This will help doctors determine your treatment if you need to be admitted to the hospital. Wash the bite area well with soap and water to prevent infection. Apply a cold compress to the bite area to prevent swelling. 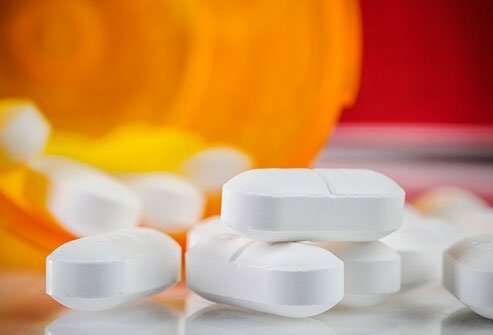 Take an over-the-counter pain reliever like acetaminophen (Tylenol) or ibuprofen (Advil, Motrin IB). A bite that worsens after 24 hours. Try to bring the spider with you to aid the doctors in selecting the proper treatment. If you think you’ve been bitten by a spider, you probably weren’t. 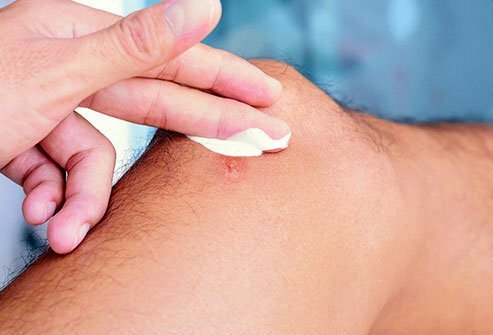 Other tiny insects like fleas and mosquitos are far more likely to have caused a bite. And if you think you’ve been bitten by a black widow, chances are you will not require medical treatment—more than half of all black widow victims never visit the hospital. You may opt for prescription drugs to ease pain and relax your muscles. That’s especially remarkable because a black widow’s venom is one of the most powerful poisons by volume in the animal kingdom. The venom contains no fewer than five potent toxins. 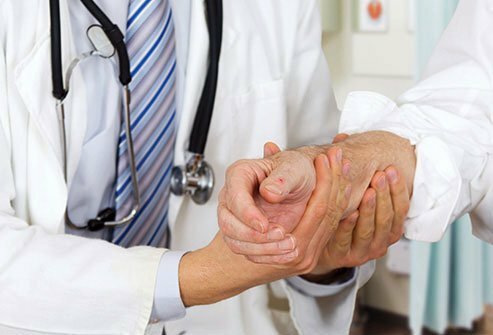 However, if the victim is very young or very old, or is weakened by another medical condition, a doctor’s treatment may be necessary. Since 1954, antivenom has been available for black widow bites. Before the invention of this antivenom (also called antivenin), about 5% of all bites resulted in death. But many doctors are reluctant to use it for two reasons. First, deaths from black widow spiders are extremely rare. Second, the antivenom itself can kill you if you are allergic, though this is extremely rare as well. Despite these drawbacks, when it is administered, the antivenom works almost immediately, relieving pain and reducing symptoms. It is also inexpensive; a dose of black widow spider antivenin costs about $30 wholesale. Treating a violin spider or brown recluse spider bite is all about managing the wound itself. Unlike black widows which use neurotoxins, recluse spider venom is a cytotoxin, meaning it harms the bite area itself. 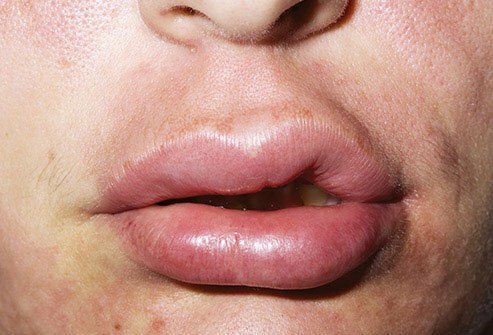 Although rare, these bites can lead to serious tissue damage that can take more than a month to heal from. To manage a wound from a brown recluse, talk to your doctor. Open sores may require daily cleaning and antibiotic cream treatment. Bumpy, red skin may benefit from antihistamines. Watch out for further symptoms, such as chills or fever, and report these to the doctor. Most spider bites cause mild reactions. But some people are allergic to spiders. This means that spider bites occasionally cause severe allergic reactions, including the most dangerous reaction—anaphylactic shock. Although spiders seldom cause this reaction, it has been reported in rare cases, and anaphylactic shock can come on very quickly and can be fatal. If you develop these symptoms, seek emergency medical treatment immediately. How Can You Prevent Spider Bites? Keep your bed away from the wall. This leaves spiders with fewer ways to climb up the bed while you sleep. Keep the area under your bed clear so spiders have fewer ways to climb. Be careful when you pull things from storage. Undisturbed areas are inviting hunting grounds for spiders. When you put things in storage, close them in zipped plastic bags, taped cardboard boxes and other secured containers. This can help keep spiders out. 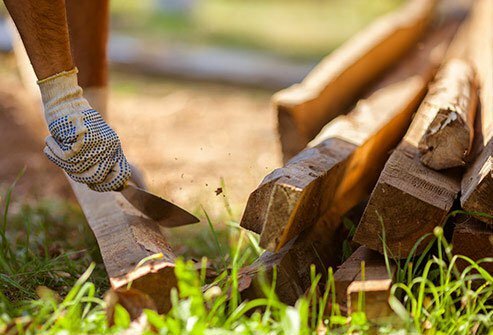 Many spiders are attracted to undisturbed wood piles and junk, so keep your yard clear. Spiders often bite when someone puts on a piece of clothing that has been left undisturbed for weeks or months. If you’re putting on a pair of shoes or a jacket that’s been left in storage, shake the clothes out first. Pesticides are largely useless against spider infestations, and may do more harm than good. A better way to control spider populations is through sticky traps. Infection. Infections from bacteria, viruses, and even fungi can cause severe skin reactions. This class of infections include Staph infections, shingles, and herpes. Drug reactions. Drugs can cause contact dermatitis, a painful skin reaction. Other bugs and arthropods. Ticks, fleas, and mites can cause painful skin reactions, including Lyme disease and Rocky Mountain spotted fever. Lyme disease can cause a bullseye pattern around a bite similar to what is seen following some spider bites. Diseases and disorders. 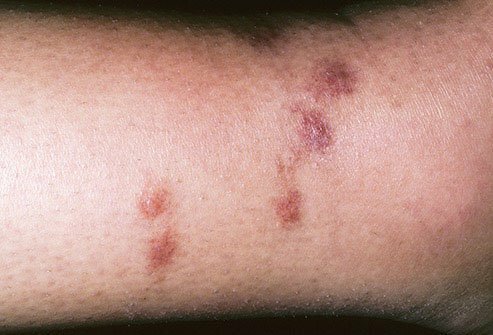 A wide variety of medical disorders may resemble spider bites, including lymphoma, diabetic ulcers, and vasculitis. Topical reactions. Touching certain harmful substances can cause nasty skin problems, including reactions to chemical burns and contact with poison oak and poison ivy. Animal Behavior: "Poke but don't pinch: Risk assessment and venom metering in the western black widow spider, Latrodectus hesperus." American Academy of Allergy Asthma & Immunology: "Spider anaphylaxis." Australian Government Department of Health: "Spider bites." Bohart Museum of Entomology: "Yellow sac spider." Clinical Toxicology: "Examination of adverse events following black widow antivenom use in California." DermNet New Zealand: "Spider bites." Johns Hopkins: "Brown recluse and black widow spider bites in children." 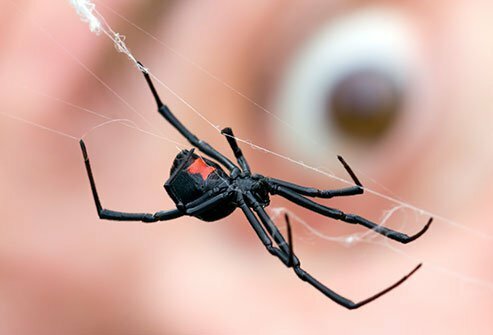 LiveScience: "Black widow's bad rap: 4 misconceptions about the spider," "The surprising cause of most 'spider bites," "Venomous hobo spider bites may be not so toxic after all." 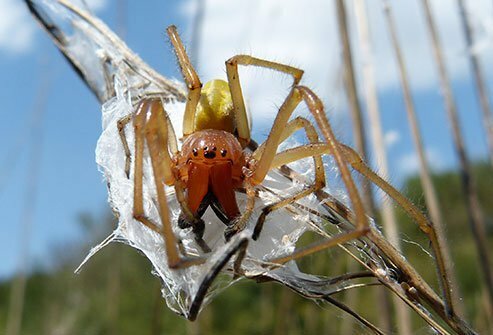 Michigan State University: "Yellow sac spiders." National Capital Poison Center: "Black widow spiders." Penn State: "False black widow spider." The Permanente Journal: "The treatment of black widow spider envenomation with antivenin Latrodectus mactans: A case series." University of California, Riverside: "Causes of necrotic wounds other than brown recluse spider bites," "Myth of the brown recluse: Fact, fear, and loathing," "Things you can do to reduce the chances of being bitten by a brown recluse spider." University of California Statewide Integrated Pest Management Program: "Hobo spider." University of Pittsburgh Medical Center: "Identifying spider bites: Symptoms and treatment."